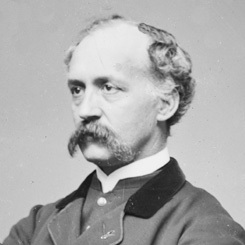 Image courtesy of the Library of Congress Henry Winter Davis of Maryland served four non-consecutive terms in the House of Representatives. A leading Radical Republican, Davis was instrumental in creating congressional reconstruction policies. On this date, the Wade–Davis Reconstruction Bill passed the House by a vote of 73 to 59. The measure set Congress’s agenda for postwar Reconstruction of the South and portended conflict with the President over that process. Named for its sponsors, Representative Henry Winter Davis of Maryland—a Baltimore Congressman and the chairman of the House Select Committee on the Rebellious States—and Senator Benjamin Wade of Ohio, the bill firmly asserted congressional control over the rehabilitation of the defeated Confederacy. It formally abolished slavery and prohibited Confederate officials and veterans from voting. The most controversial provision required that a majority of the voters in each state swear their allegiance to the United States before re-admittance into the Union. Representative Davis declared that until Congress recognized “a state government organized under its auspices, there is no government in the rebel states except the authority of Congress.” President Abraham Lincoln’s plan was far more lenient, requiring only 10 percent of the voting population to take a loyalty oath. Lincoln pocket vetoed the Wade–Davis measure. The two sponsors countered with the “Wade-Davis Manifesto,” denouncing President Lincoln for thwarting congressional powers; later, Congress resurrected portions on the un-enacted bill as a blue print for Reconstruction.